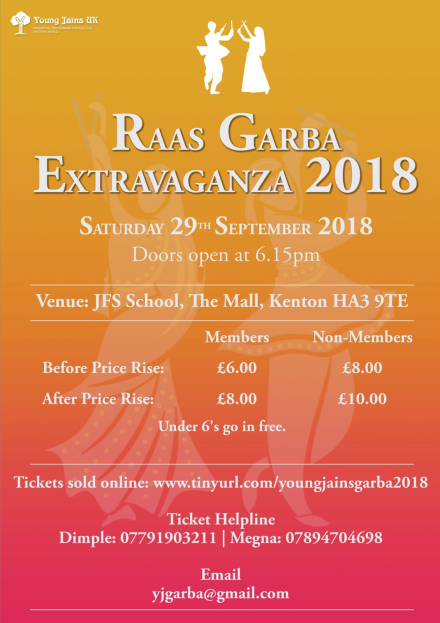 In addition to the Young Jains regular events of Sweet Harmony, Yoga and Feeding the Homeless, the below events have also been organised, planned and delivered by Young Jains throughout 2018. To make the most of the sunny weather and to kick start a summer filled with Young Jains awesomeness, we would like to invite you to our summer family picnic. This will be a fantastic opportunity to reminisce with old friends, meet new like-minded people and find out how you can get involved with events we have planned for the rest of 2018! Param Pujya Sadhvi Shri Shilapiji Maharaj explained how meditation and mindfulness are integral to achieving a purposeful, compassionate and peaceful existence. An event not to be missed by young people whose work and social lives can often be replete with stress. 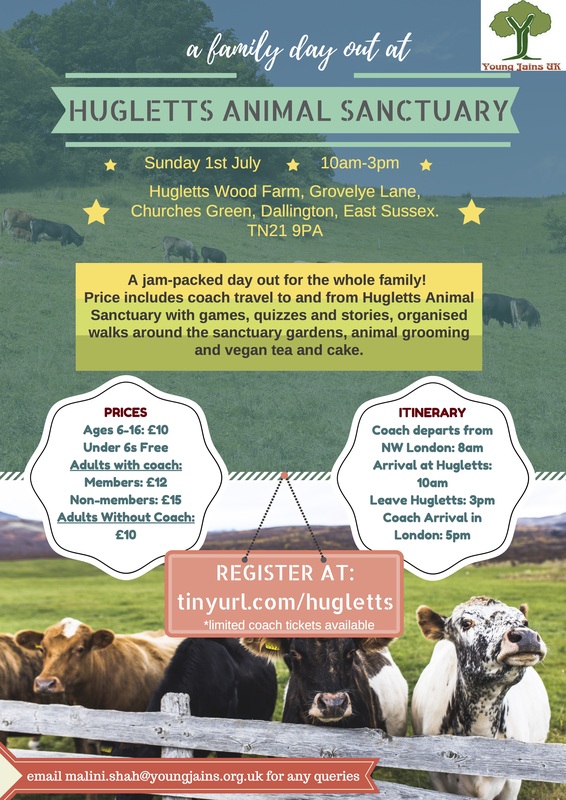 Young Jains are providing you and your family a chance to meet the residents of Hugletts Animal Farm and witness compassion first hand. This is a place like no other – spend time with the cows, feed the sheep and immerse yourself in the woodland. There will be a chance to learn about how the animals are cared for and how the staff at the Farm transform the animals’ life. 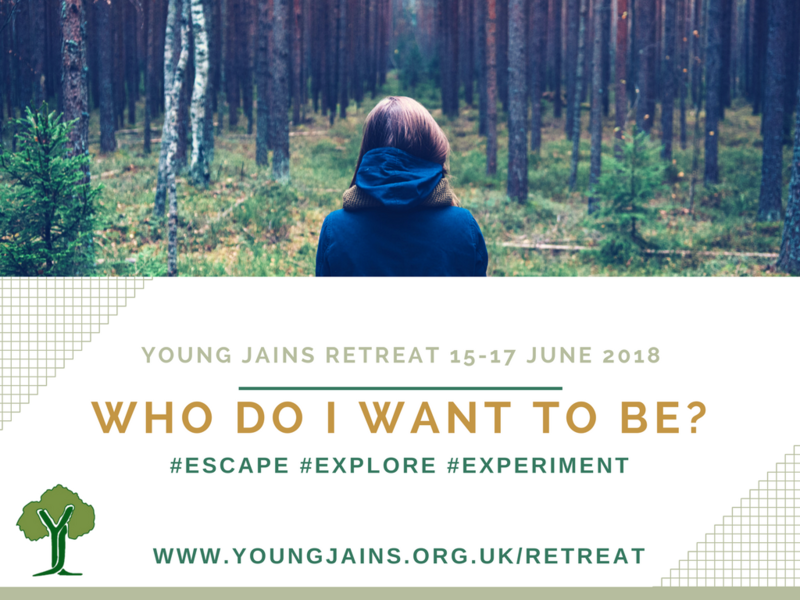 We are very excited to announce our summer residential retreat 2018! 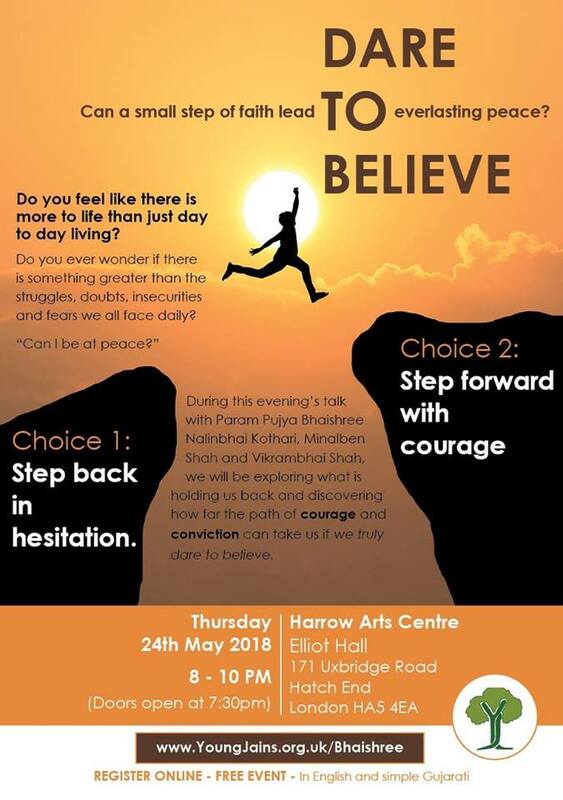 An inspirational evening with Bhaishree Nalinbhai Kothari, Minalben Shah and Vikrambhai Shah. Param Pujya Bhaishree embodies the messages of Bhagwan Mahavir and Shrimad Rajchandra, and is the spiritual head of Shree Raj Saubhag Satsang Mandal. Join us for an interactive workshop exploring the Jain virtue of compassion. We will examine how the Jain concept of compassion differs from western concepts of compassion, discuss what makes compassion different from non-violence, and provide tips on how we can cultivate compassion in our daily lives. The workshop will be run in simple English, and will be suitable for people of all ages. Please bring yourself, a friend, a pen and a notepad. 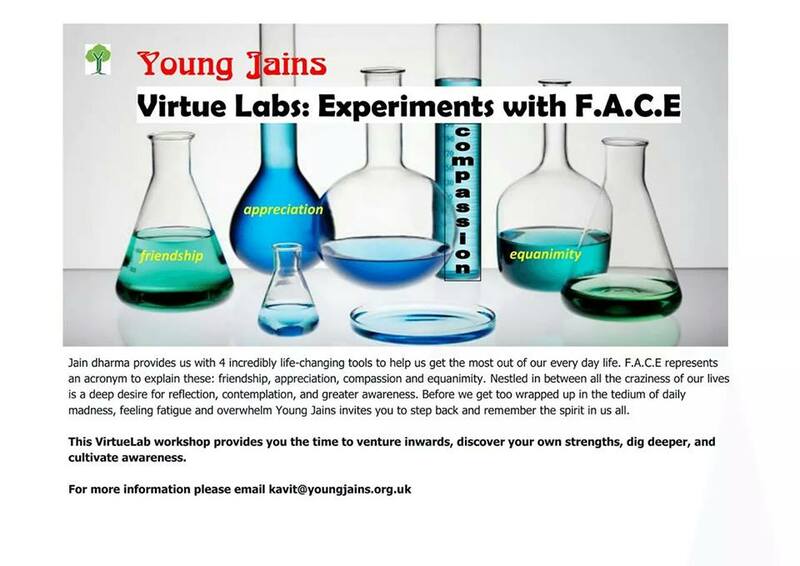 Part of the Young Jains VirtueLab series exploring friendship, appreciation, compassion, equanimity (F.A.C.E), VirtueLab sessions aim to give you time to venture inwards, discover your own strengths, dig deeper, and cultivate awareness. Did you know practicing gratitude has been shown to improve your overall well being, relationships and learning abilities? Learn about these and other benefits at the workshop. Following the success of the Gratitude Workshop on 19th November and interest from those who missed that event, we will be running The Gratitude Workshop again. This workshop will explore gratitude; what it is, how it helps with reducing stress, increase well-being and happiness, as well as dealing with life’s daily challenges and spirituality. Gratitude helps cultivate other virtues such as compassion, humility, positivity and contentment. We will share what the science of happiness says about gratitude. 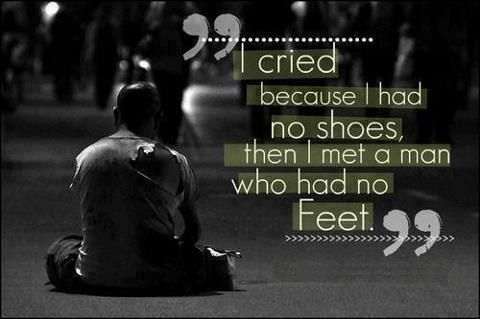 Most importantly we will share powerful exercises to cultivate gratefulness that you can use immediately. It will move you at your core. This VirtueLab workshop provides you the time to venture inwards, discover your own strengths, dig deeper, and cultivate awareness. Please bring yourself, a friend, a notepad and pen.